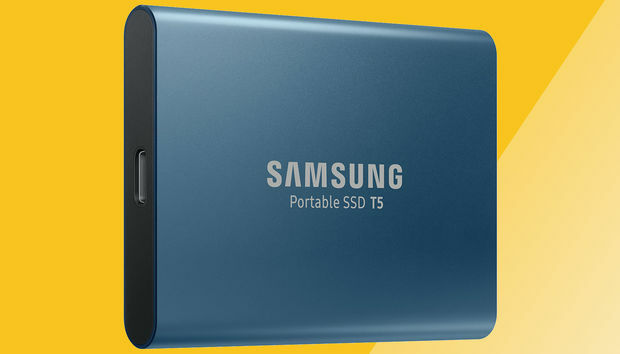 When it comes to fast, durable, convenient portable external storage, the Samsung T5 leads the pack. And right now, our favorite portable SSD is on sale for $128Remove non-product link, the lowest we've seen it and a steep discount from its $190 list price. This small, light SSD features 500GB of storage, which you can password-protect for added security. It's fast, with read-write speeds up to 540 MB/s, and light, at just 1.6 ounces. For extra peace of mind, this SSD is as durable as they come—it's shock-resistant enough to handle falls up to two meters. We gave the 1TB version of this portable drive 4.5 stars out of 5 for its killer performance and convenient size and shape. (That version of the drive is also on sale for an all-time low of $300.Remove non-product link) As we mentioned before, this is our favorite external drive for performance not just portability, a category with some serious competition. To see others on our list and check out other less-portable external drives, visit our roundup.